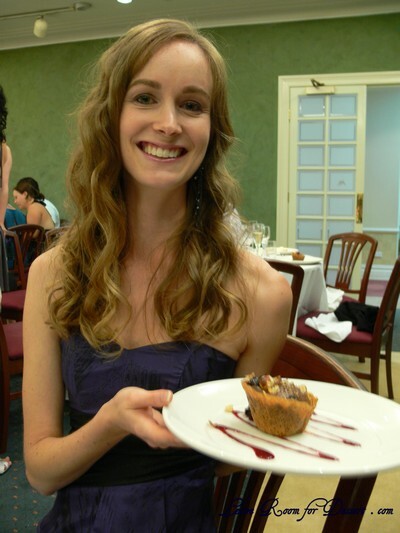 Now, I don’t suppose you could call anything with puff pastry healthy. Although, you could say this is healthier than the normal sausage roll. 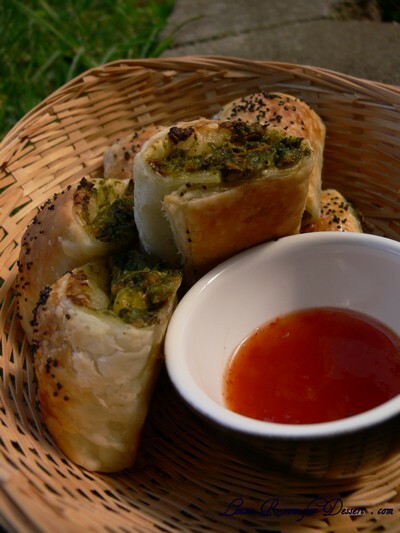 These vegie rolls are packed full of vegetables, most of which you might not be able to guess while eating them. So, unsuspecting kids (and adults) will get a vegie fill when they go for these rolls at a party. I decided to make this recipe combining many vegetables I had on hand, so I’m sure it can be altered to what you have lying around. Mix all the vegetables in a large bowl. Add the ricotta, egg and sweet chili sauce, mix to combine. Add the breadcrumbs and mix until fully combined. Cut the pastry sheets in half. 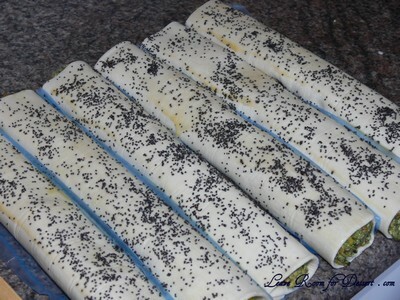 Spoon equal amounts of the vegetable filling down the middle or side of the pastry sheet – to form an even roll. Place a small amount of egg wash down the length of the puff pastry. Roll the pastry up firmly and sealing with a little pinch on the edge. Brush some egg wash over the top and sprinkle with poppy seeds. At this stage, either freeze as they are (with some baking paper or puff pastry plastic between the rolls) or, to eat straight away – preheat oven to 180°C. Cut each roll into 5 equal portions. Place on a baking paper lined tray and place in the preheated oven for 15 minutes or until they are browned and cooked through. Serve with sweet chili sauce. For Frozen rolls, allow to thaw enough to cut through with a knife. Cook in a preheated oven (180°C) for 20 minutes or longer, depending on how much they have thawed. Filed under Appetizers, Party Food, Recipes, Snacks, Vegetarian. You can follow any responses to this entry through the RSS 2.0 feed. You can leave a response, or trackback from your own site. Wow, what a great way to get a variety of vegetables into children and adults alike!! 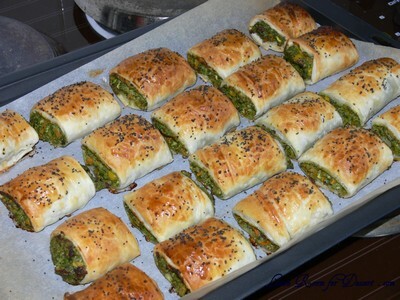 I really like the idea of vegetable rolls, another great recipe from you, keep them coming!! Mmm, I like the sound of the ricotta and mushrooms. It’s a good thing to have at a party for vegetarians too. These look amazing! 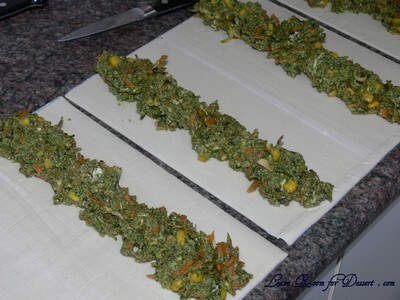 I never would have though to use puff pastry for vegetable rolls. You’re right, it’s probably not healthy, but it sounds so good! 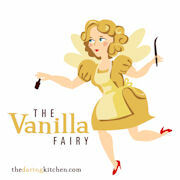 And perfect for tricking any “veggie haters” into enjoying their veggies. 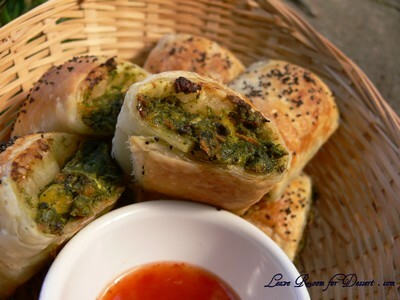 These look delicious, far better than any sausage roll. Want to reach into the screan and eat them all! 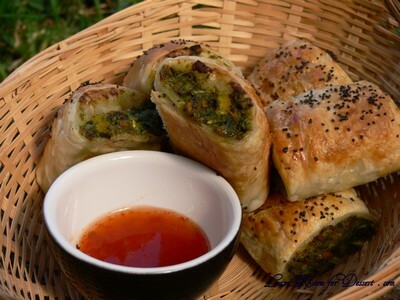 These look so much better than sausage rolls….! Hmmm… I’m constantly searching for ways to make my nephew love vegetables. I remember when I was young it was a chore to eat veggies – having it in a roll is great as I know all kids of rolls.. I could tell him it is a surprise sausage roll – the surprise? No sausage but just as delicious! all I can think of is that flaky pastry with loads of poppyseeds ontop. You’re right, its a great way to get more veggies into you! Great idea…love the veggies in it…so colorful and tasty. Must taste so yummie in puff dough. I much prefer these over sausage rolls any day! They look perfectly crispy and filled with the type of goodness that could make me happy. Yum! 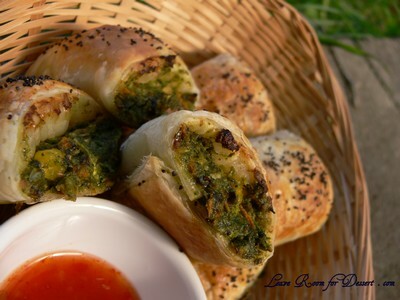 love the veggies in the rolls…can’t get enough of them!